Given his track record at Nintendo you could forgive gaming legend Shigeru Miyamoto for taking a little rest on his laurels, but the man behind Mario is not ready to give up trying to innovate in the name of next-gen gaming. So the Wii U is a little, well, confused, throwing more control methods at us than the average airport cockpit, but Miyamoto rightly claims that innovation is as (if not more) important than just making the next Sports/Fitness/Shooting game look shinier and more realistic. "Whenever we're working on a certain platform, as time goes by, everybody, including the game players, is looking forward to more improved versions of the existing software," Miyamoto told Games Master via CVG. "However, that's not only the direction that evolution should take," he added. "Whenever we can create a different format, unique gameplay should be another direction where game entertainment should head. 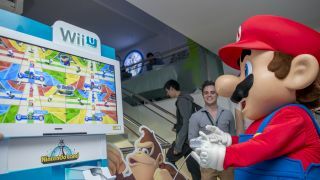 "For example Nintendo Land, which is going to debut with the launch of the Wii U system. We've included a variety of games inside of it, some of them will be able to show the way the future of gameplay might head." So, we can expect a heady mixture of the monumentous (Wiimotes) and the, frankly, mental (pulse monitors) as Nintendo continues to plough its occasionally wacky furrow as a family focused gaming company.